Our AMNÂ® (Active-Micro-Nutrients) products pursue the way of a vitalising cultivation of plants. The benefit of a vitalising plant production is a fully functional defence and immune system of the plant. Thereby, the risks of getting pests and diseases become very low and the plants are prepared to withstand periods of stress. The use of conventional plant protection is no longer necessary or can be reduced drastically. These vital plants as well as plant products are therefore better looking and much more attractive for the market. All of our products are produced in a sustainable manner and with organic resources. The products do not harm beneficial insects. If used properly and as advised, there is no danger for the environment, humans or animals. In addition, they comply with EC-directive VO (EG) 834/2007 and EC-directive VO (EG) 889/2008 and are approved for organic farming. Products are listed with FiBL and with ECOCERT EU 889/2008 allowed Annex 1. Most products are liquid concentrates and available in containers of 5l, 10l or 20l. Rather than fighting against particular plant diseases, the future of plant production is all about the organic and sustainable production of healthy plants that are capable of resisting stress situations without any harm. AMNÂ® BioVit is an organic plant additive, which is produced in a specially developed process. Due to a high concentration of garlic extract, the product contains huge amounts of helpful amino acids, trace elements and micronutrients. Great results especially with roses, viticulture, berry and vegetable cultivation. AMNÂ® BioVit increases the natural taste of fruits and vegetables as well as the sugar levels in berries and grapes. Can be combined with plant protection products and pesticides and thereby increases the impact of those products. To obtain best results, it should be used preventively and regularly. Please find the correct application and dosage in the downloadable PDF info or on product labeling. AMN BonaVitaÂ® is an organic plant and soil additive. In more than 10 years of research we have managed to analyse the substances that are present in primeval forest soils around the world and missing in modern soil substrates and intensively farmed soils. A manifold range of these nutrients, found in nature, is contained in AMN BonaVitaÂ®. These nutrients vitalise the soil and feed important micro-organisms at the same time. Works successfully as a feed for young plants, orchids, cacti and vegetables. The frequent use of AMN BonaVitaÂ® allows a reduction of fertilisation up to 30%. Contains proteins, amino acids, and vitamins. These substances are essential for the feeding of plants and the development of micro-organisms and natural fungi like Mycorrhiza. Can be sprayed and used for all pouring and watering systems. An innovative and cost-effective way of soil and plant nutrition combined with the capable Bazillus amyloliquefaciens. AMN BonaVitaÂ® Bac builds a natural antagonism within the soil and at the root area. Thereby, this product promotes the healthy growth of plants. Especially successful in combination with fungicides, because it helps to re-establish and enforce beneficial micro-organisms like mycorrhiza, which have been harmed by fungicides. In future, horticulture will increasingly rely on plant strengthening. Strong and flourishing plants are more successful to cope with stress symptoms and stay healthy.AMN FusekÂ® is an organic plant additive. It is produced in a specially developed process and contains, among other things, plant extracts, compost essence, and homoeopathy. Suitable for all plant species. We have made especially good experiences with cultures like soft fruits, vegetables, herbs, vine, and ornamental plants. Special mixture of plant and compost extracts as well as homoeopathic agents. The treated plants absorb AMN FusekÂ® but do not take on the flavour. Sugar levels in wine, berries and other fruit tend to increase by 10 -20%. Wasps and mosquitos avoid the treated areas. Most plants have symbiotic relationships with natural fungi called mycorrhiza. They form a very dense mycelium network around the plantâ€™s roots, improving the uptake of water and nutrients. As a result, the plant is producing growth hormones, which encourage the plantâ€™s metabolic processes. 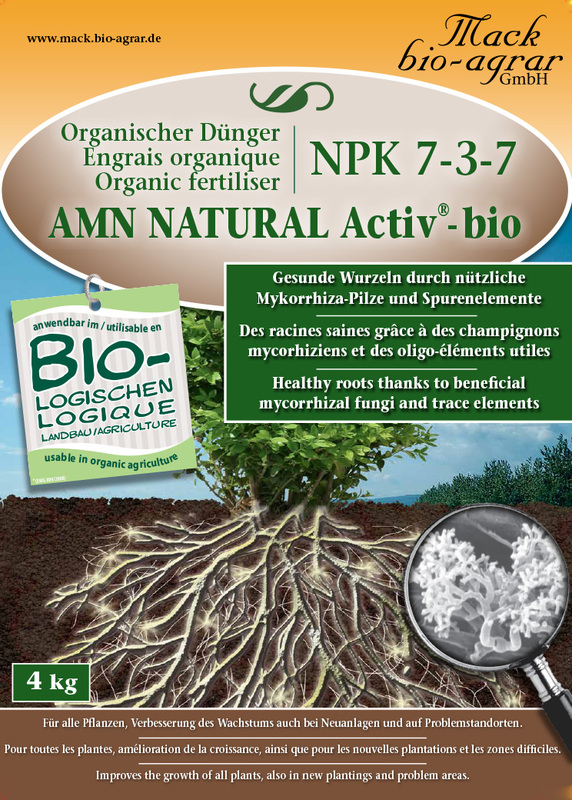 The living mycorrhiza fungi contained in AMN NATURAL ActivÂ® - bio supports the development of the important symbiosis between plants and fungi that is often hindered or completely paralysed due to unfavorable soil conditions. This is especially important for new plantings and re-cultivations. AMNÂ® Natural Activ -bio is an ideal fertiliser for potting soils. Beside the friendly mycorrhiza fungi it also contains horn chippings and extracts of molasses, this combination promotes the microbial activity. More blossoms, making the plant form fruits much earlier and intensifies their quality. Mycorrhiza increases the root surface of plants with a factor of around 1000. AMNÂ® Natural Activ - bio provides instant greening in problem areas, e.g. during slope stabilization, roof greening installation and planting of sporting fields. Root development is improved, a more lush growth is obtained and flowering becomes abundant. Especially in case of potted crops. This fertiliser can shorten the growing time due to earlier flowering. AMNÂ® Natural Activ -bio is an ideal fertiliser for potting soils. Beside the friendly mycorrhiza fungi it also contains soft ground rock phosphate and extracts of molasses, this combination promotes the microbial activity. Since ancient times marine algae are used in order to enhance the health of soils and plants. AMNÂ® Northern Algae is a purely organic extract made of marine brown algae. The algae are carefully harvested and gently processed in order to ensure a high quality product. AMNÂ® Northern Algae is rich in trace elements, vitamins, enzymes, amino acids and alginates. We have made good experiences especially with the cultivation and care of orchids as well as combining this product with NeudosanÂ® Neu against the grey cabbage aphid. AMNÂ® Northern Algae compensates deficiency symptoms of plants, enforces their natural resistance against pests and harmful fungi (especially rot fungi). AMNÂ® Northern Algae stimulates the germination, root growth, activates the nutrition intake and enhances the whole plantâ€™s growth. Please find the application and dosage in the downloadable PDF info or on product labeling. AMN OptiferÂ® is an effective micro-nutrient fertiliser made of plant substances. It supports micro-organisms and maintains the natural soil balance. Produced from bark, according to the original Swiss formula. The optimal solution for plants that require higher amounts of iron. For example citrus fruits, roses, fruits, vegetables and ornamental plants. We have made good experiences especially with hydrangea, rhododendron, orchids, herbs, potatoes, and tomatoes. The carrier molecule in optiferÂ® has a giant molecular structure, which stays active within the soil for a very long time. Feeding the soil with fermented organic herbal plant substances improves the soil fertility and results in sturdy and healthy plants. Active-Micro Nutrients (AMNÂ®) PowerFertiliser provides an ideal mixture of major nutrients as well as trace elements, which are essential for strong and healthy plants. Contains iron chelate derived from the bark of fir trees. Contains vitamins and homoeopathic agents stimulating and activating micro-organic processes within the soil, which are vital for a healthy plant growth. Trichoderma is a mould fungus that can naturally be found in soils. It is the combination of two types of Trichoderma fungi that makes AMNÂ® Promot unique. On one hand, there are different strains of Trichoderma harzianum that already start to be active at low temperatures like 8Â°C. On the other hand, there is Trichoderma koningii, which comes into full effect at around 35 Â°C. In exchange for metabolic products of the plant, Trichoderma propagates in the root hair area, where it produces enzymes and hormones promoting the plantâ€™s growth, blossom, tillering, strength, competition against harmful fungi and increases its yield. These fungi also make fixed phosphorus within the soil accessable for the plant. An additional fertilisation with phosphorus becomes unnecessary. Trichoderma competes with many germs living in the soil, such as Rhizoctonia, Pythium, Phytophtora, Fusarium, Verticillium, Phomopsis and Botrytis for nourishment and space. Trichoderma produces an enzyme called cellulase, which recycles the plantâ€™s metabolic products via their root epidermis, which leaves harmful fungi without any nourishment. Suitable for the cultivation of cut flowers, potted plants, seed farms and vegetables in green houses and open-air. In case of young plants, mix into substrate or pour or dip containers before planting. Ideal for propagation by cuttings. Feeding the soil with fermented organic herbal plant substances improves the soil fertility and results in sturdy and healthy plants. Active-Micro Nutrients (AMNÂ®) Roses provides an ideal mixture of major nutrients as well as trace elements, which are essential for strong and healthy plants. Besides for rose it can be used for all other types of plants as well. Please find the corect application and dosage in the downloadable PDF info or on product labeling. Feeding the soil with fermented organic herbal plant substances improves the soil fertility and results in sturdy and healthy plants. Active-Micro Nutrients (AMNÂ®) Verde provides an organic wholesome nutrition for plants. Produced of natural resources and a homeopathic agent, AMNÂ® Verde contains valuable and major nutrients, trace elements as well as natural iron chelate. Works successfully as a feed for young plants. Can be used for sensitive plants, hibernation of plants as well as nutrient-poor systems. Especially successful with herbs and medicinal plants. Stimulates the metabolism of plants. BIPLANTOLÂ® supports plants from the inside out. Plants stressed by diseases or other environmental influences can recover more easily with pre-emptive and repeated applications of BIPLANTOLÂ®. This is due to an enhanced ability of the plant to regenerate from habitat and climatic stresses. Soil micro-organisms are promoted and stimulated. Treatment with homoeopathy leads to more robust plants and improved growth. BIPLANTOLÂ® is absorbed through leaves, needles and roots. Please find application and dosage in the downloadable PDF info or on the product labeling. BIPLANTOLÂ® supports plants from the inside out. Plants stressed by diseases or other environmental influences can recover more easily with pre-emptive and repeated applications of BIPLANTOLÂ®. This is due to an enhanced ability of the plant to regenerate from habitat and climatic stresses. Soil microorganisms are promoted and stimulated. Treatment using homeopathy leads to more robust plants and improved growth. BIPLANTOLÂ® is absorbed through leaves, needles and roots. BIPLANTOLÂ® X2 forte is a dynamized-homeopathic agent containing potentized (D6-D100) minerals such as potassium, calcium, iron, magnesium, phosphorus, sulphur and essential trace elements such as boron, organic germanium, silica, copper, manganese and also uronic acids (plant mucilage) as well as ethereal oils.